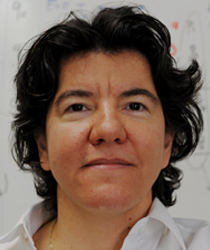 Sennur Ulukus is the Anthony Ephremides Professor in Information Sciences and Systems in the Department of Electrical and Computer Engineering at the University of Maryland at College Park, where she also holds a joint appointment with the Institute for Systems Research (ISR). Prior to joining UMD, she was a Senior Technical Staff Member at AT&T Labs-Research. She received her Ph.D. degree in Electrical and Computer Engineering from Wireless Information Network Laboratory (WINLAB), Rutgers University, and B.S. and M.S. degrees in Electrical and Electronics Engineering from Bilkent University. Her research interests are in communication theory, information theory, networks and signal processing, with recent focus on private information retrieval, age of information, energy harvesting communications, physical layer security, and wireless energy and information transfer. Dr. Ulukus is a fellow of the IEEE, and a Distinguished Scholar-Teacher of the University of Maryland. She received the 2003 IEEE Marconi Prize Paper Award in Wireless Communications, an 2005 NSF CAREER Award, the 2010-2011 ISR Outstanding Systems Engineering Faculty Award, and the 2012 ECE George Corcoran Education Award. She is a Distinguished Lecturer of the Infomation Theory Society for 2018-2019. She is on the Editorial Board of the IEEE Transactions on Green Communications and Networking since 2016. She was an Editor for the IEEE Journal on Selected Areas in Communications–Series on Green Communications and Networking (2015-2016), IEEE Transactions on Information Theory (2007-2010), and IEEE Transactions on Communications (2003-2007). She was a Guest Editor for the IEEE Journal on Selected Areas in Communications (2015 and 2008), Journal of Communications and Networks (2012), and IEEE Transactions on Information Theory (2011). She is a TPC co-chair of 2019 ITW, 2017 IEEE ISIT,2016 IEEE Globecom, 2014 IEEE PIMRC, and 2011 IEEE CTW. Communication theory, information theory, networks, signal processing. When implanted medical devices transmit and process data, they can generate heat detrimental to body tissues. His research addresses reliability, timeliness, security and robustness in existing and emerging communication and computation settings. Sennur Ulukus will serve as the Associate Chair for Graduate Studies from 2018-2021. Tandon has been recognized for his work on wireless networks and cloud computing environments. The fellowships are awarded to outstanding students in the final stages of dissertation work in recognition of their research excellence. The chaired professorship provides annual support for a faculty member in the field of Information Sciences and Systems in the Department of Electrical and Computer Engineering. At Maryland, Bassily was advised by Professor Sennur Ulukus. She has been selected by the Information Theory Society as one of only five Distinguished Lecturers for 2018-2019. Clark School Researchers Recognized Among "World's Most Influential Scientific Minds"
Three Clark School faculty members have been named to Clarivate Analytics' 2017 Highly Cited Researchers list. The research will address practical issues arising from user misbehavior, conflicting user interests, lack of complete network state information; and to devise practically implementable codes.